About | Ltd. "Company "Penopol" tm "Kenopol"
We are working for you, so your brightest designing ideas will come to life and your interior will make you happy every day! 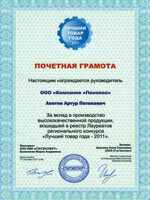 Ltd. «Company «Penopol» was based in 2004. During this ten-year experience of work our company has fixed its place in the market of finishing materials. During this time we have refined our production process and the strategy of managing. And because of this nowadays our company has a good reputation as among our partners, as well as among clients. At this moment we are one of the leaders in production of finishing materials from Styrofoam. The technology of our production lets us to make high density and quality products and because of this the whole spectrum under the trademarks of «Kenopol» and «Penopol» are an alternative solution between polistirol and polyurethane. At the moment the assortment of ceiling moldings and rosettes of our company is more than 170 types of differently designed and sized products and we don’t intend to stop there. In 2004 we started the production of ceiling moldings and rosettes from Styrofoam. In the beginning we made only 3 models of rosettes and 2 ceiling moldings. During this time we were working on new designs and new models, as well as were refining the characteristics of the present ones. In the end we got good quality and that made us make our assortment wider. 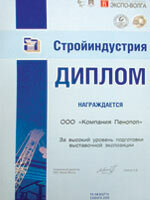 In the end of 2005 the company “Penopol” produced 12 new models of ceiling moldings and 12 new rosettes. In this year we started the production of decorative moldings and corner elements to them. Later, in 2006, we made another 14 ceiling moldings, 15 rosettes and 12 decorative moldings, designed by ourselves. 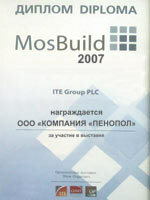 The next episode of growing was the starting of production of extrusion ceiling moldings in October 2006. In 2007 we produced 12 more models of ceiling moldings and rosettes and also 4 models of pilasters, which consist of capitals, body and base. We also are the first ones who made rosettes with a diameter of 1000 mm. (R40). Finally, in 2008, we started the new series of rosettes R41…R48, with a diameter of 670-770 and injection ceiling moldings from P40…P48 and a few new models of corner elements. In 2009-2010 the assortment of ceiling moldings was widened till P49…P56 and the rosettes R49…R53. In 2011-2012 the assortment of ceiling moldings was widened till P57…P63 and the rosettes R54…R58. In the modern world being competitive is a decisive factor for success in the market. Its worth to mention the high interest for the production of Ltd. “Company “Penopol”, as because of the high density, quality and individual packing, our production is not only highly competitive, but also has the unique combination for Russian market “price-quality”. The density of our products is much higher than the analogs of other producers and is competitive with productions from polyurethane, but is much cheaper. Besides, the advantage of our company is our exclusive production (Wide ceiling moldings with dimensions 180*175 mm and rosettes with a diameter of 1000mm). Attention! In March 2014 we have started the production of a new line of injection ceiling moldings with a unique technology Know-how and Skin with German machines of company Kurtz. GMBH under the trademark of GLANZEPOL. The distinctive feature of the new production is the perfectly smooth surface and accurate docking of the designs. Presently there are 14 types of injection ceiling moldings under the trademark of Glanzepol from GP1 to GP14. Nowadays Ltd. “Company “Penopol” is a dynamically growing company, which consists of large representative and dealers net in different regions of Russia and CIS. 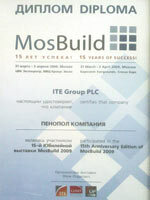 We always take part at the largest in Europe building-interior exhibition “Mosbuild”. 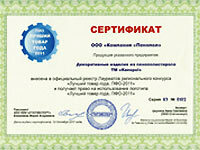 The production of Ltd. “Company “Penopol” meets all the international standards. Every product has its identical number(barcode) and is individually packed. We are always glad to new cooperation and hope to see you as a partner and a friend!